The Core Indicator for tracking this quantitative measure of progress is #2: Number of additional users of modern methods of contraception. To calculate its value, we subtract the estimated number of women and girls using modern contraceptive methods in the current year from the number in 2012, the year of the London Summit on Family Planning. The difference represents change during FP2020’s first year. The available data indicate that across the 69 FP2020 focus countries, 8.4 million more women and girls used modern methods of contraception in 2013 as compared to 2012. About half of these additional users are from increases in contraceptive prevalence, and the other half can be attributed to an increase in the number of women and girls of reproductive age. As shown in Figure 4.3, this falls just below the 2013 benchmark goal of 9.4 million and above what was projected from historical growth patterns. 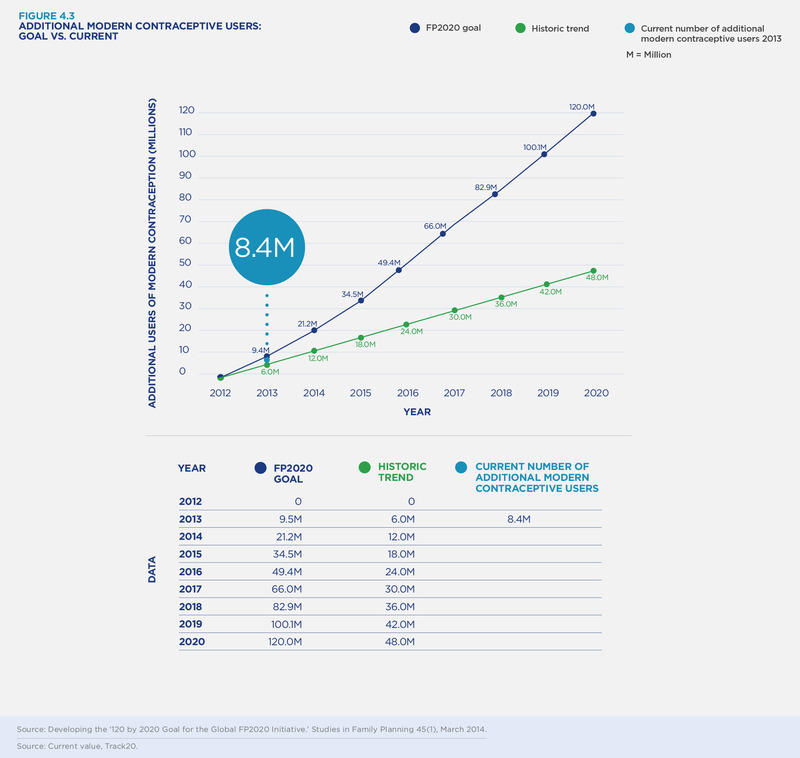 However, it is important to note that the projected buildup of the number of additional modern contraceptive users assumed that progress would be slower in the early years of the initiative, then accelerate as countries mobilize resources and improve national family planning program performance. Therefore, the most appropriate conclusion is that we are still on course but need to accelerate progress in order to have a greater impact on the number of women and girls gaining access to modern methods of contraception. Learn more about FP2020 Core Indicator key findings for 2013 in our full progress report.